There are places you know you will miss from the first moment you set your eyes on them. Those places feel like home without you even having thought of visiting before. Deep into the Caucasus Mountains, where Georgia ends and Russia begins, at the top of Cross Pass outside Gudauri, you can still find high mountain peaks, desolate roads, rugged landscape, and unexplored wilderness that make my heart sing. High up there, where >5000m peaks kiss the bright blue sky and most people lose their breath, that is where I get found. The wilderness speaks directly to my soul, it calls my wild heart, it urges me to explore. It calms me down, I sleep without a single worry, nothing matters and all our “modern” concerns seem like “first world problems”. Gudauri is the largest ski resort in Georgia hidden deep in the Caucasus Mountains on Georgia Military Road almost all the way to the Russian border. 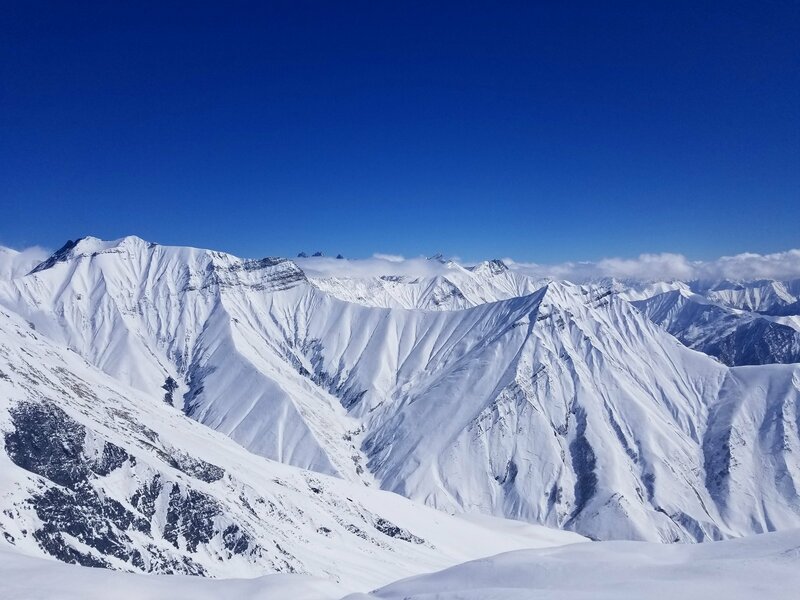 Gudauri Ski Resort‘s base is at >2000m, its highest chair lift reaches 3200m, so with a vertical drop top to bottom on a ski run 1200m, it will surely make your legs shake 🙂 All 75km of groomed ski runs in Gudauri sit above tree line facing the sun and grant you the view of a lifetime every single chair ride. In terms of snow conditions, terrain quality, lift services and variety of ski runs, Gudauri can rival any ski resort in the Alps and the Rockies. They just added 4 new chair lifts this season and opened a whole new valley on the back side (Kobi) to off piste skiing and riding. Yet you can still have the whole resort to yourself and ski right behind the snow cat on empty slopes during the week. Since I was in Gudauri for 2 weeks with IntotheWild.bg, we could choose what to do each day depending on the conditions. We rode off piste every time we got a foot of new snow and on the days when Ullr didn’t deliver overnight freshies, we basked in the sun and rode soft groomers. Because when you go to the Caucasus Mountains you get equally spoiled by fresh snow and freshly groomed slopes! Gudauri Ski Resort offers 3 valleys with lift serviced terrain for off piste skiing/riding. In addition, there are multiple backcountry and ski touring routes if you are willing to take a hike for an hour or two and earn your turns. On our days off from skiing (2 in total for two weeks), we checked the Russian baths in Gudauri (Tsar Bani) for an authentic experience at the highest steam baths in the world and took a shuttle to the village of Kazbegi to visit Rooms Hotel for its signature view which overlooks Mt Kazbeg and Gergeti Trinity Church from the balcony. Only later did I find that Mt Kazbeg (>5000m = >16000ft) is a dormant volcano, no wonder I fell in love with it at first sight! In Gudauri I recommend staying at Quadrum Hotel (under $100 for a double room, breakfast with a view included). Brand new and built only with natural materials in simple and modern Scandinavian style, it offers a spa and swimming pool, as well as daily yoga classes to meet all your post-skiing / hiking needs and soothe your sore muscles. There is a bar and restaurant on site as well where you can grab dinner as you’ll be exhausted after a day of skiing and unwilling to look for a place to eat down the road in town at night. In Kazbegi Rooms Hotel (over $100 for double room, breakfast with a view included) gets my vote for fantastic design, superb amenities, fusion cuisine and incredible service. You’ll notice there are many cheaper options in Georgia but as with every developing country, you get what you pay for, so be careful how excited you get about a budget room, especially if your budget can accommodate a comfier experience 🙂 Remember to book both hotels well in advance as they usually sell out during the main season. Considering my obsession with high mountain passes, Georgia Military Road deserves its own blogpost but I’ll try to give it enough attention here before I return to explore it further in summer. Georgia Military Road is one of ONLY 2 passes that connect Georgia with Russia over the Caucasus Mountains. Being a major road artery, the pass is usually well cleaned after a snow storm (or completely closed during one) and is quite busy with semi truck traffic. The highest point is Cross pass (Jvari Pass) right outside Gudauri Ski Resort at 2379m (7815ft). In winter the road works only in one direction in 2 hr intervals as the “tunnels” (actually avalanche barriers) are too narrow for two trucks to pass at the same time. There is a separate lane for summer that allows two way traffic but it is closed in winter as it is too dangerous to drive on that sliver of asphalt on the cliffside with no barriers and vertical drops at most places. The travel was very oriental and interesting, safe, cheap, and by no means difficult. Culture shock abound for my Western friends every step of the way – squat toilets with no paper at the Bulgarian-Turkish border (yes, we had to cross the border on foot at night in the middle of a rainstorm), perfumed alcohol in the bus to disinfect your hands, having to haggle for your bottled water (because you have to haggle for everything in the Middle East), et all. Since we were coming from a place with no snow and going thru a place with no snow, everyone was really interested in us and where we are going with all this snowboarding gear. Some people had never seen snow, most couldn’t even perceive the idea that we were taking a bus to a shuttle to a plane to a taxi to a winter resort in Georgia almost on the border with Russia. Last but definitely not least, I couldn’t get over was how sweet, kind, and hospitable the locals were, everywhere! Georgia is still very real, rural in places and rough around the edges at times, but that just adds to its local charm. Go visit while it is an up and coming destination, affordable and a developing tourist market and not yet full of foreigners and skiers. There is just SO MUCH to see and explore in Georgia, I only went to Gudauri and the Kazbegi Region but I will definitely be back in summer to hike the Caucasus Mountains, visit the wine region and experience the famous Tbilisi nightlife!